QUIKSTEEL is a steel fortified, high temperature (500�/260�C) epoxy putty that can be used to make quick, permanent repairs of all materials except rubber. * It can be used to repair products and parts made of steel, copper, aluminum, cast iron, stainless steel, galvanized steel, brass, bronze, chrome, silver, gold, exotic metals, glass, plastic, fiberglass, epoxy fiber materials, PVC, concrete, ceramic, brick, tile and porcelain. (*QUIKSTEEL will adhere to rubber, but it will not maintain its bond on rubber products that are constantly flexing). QUIKSTEEL is ideal for repairs to materials, parts and products where conventional heat welding cannot be accomplished due to the material, location of break, access, or difficulty of disassembling the product or part. Because it has the consistency of putty and will not run, the repair can be made overhead or in the vertical plane, as well as the horizontal plane�even inside tanks filled with fluids or chemicals. QUIKSTEEL will setup under water or in fluids. QUIKSTEEL is impervious to chemicals, solvents, oils, and acids including battery acids. No special tools or training is required to successfully used QUIKSTEEL. After QUIKSTEEL is fully cured (60 minutes), it can be milled, machined, drilled, tapped, shaped, filled, sanded, and painted. You can do anything to QUIKSTEEL that you can do to metal or wood. Will not rust or oxide. Is impervious to chemicals and corrosion. Fast curing. Sets in 4 o 5 minutes, is hard like steel in 15 minutes, and fully cured in 60 minutes. Has a minimum three year shelf life prior to mixing. A QUIKSTEEL repair will last forever after it is fully cured. Is waste free. The exact amount can be cut or broken off from the master stick for mixing. Is ideal for making repairs on the road, in remote locations, etc. Is an ideal emergency repair product for toolbox, car, truck, off-road vehicle, boat, etc. Can be used as a sealant, adhesive, putty, cement, or to mod, reshape or reform products. Mix epoxy putty until it is a consistent gray color free of any black specs (it probably will start to get warm at this point). Once the putty is warm and the color is consistent, you have about 5 minutes to mold, form, seal, cement, and otherwise make repairs using QUIKSTEEL starts to set. 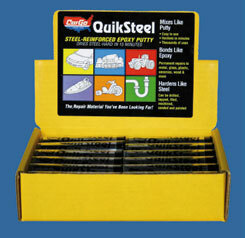 Once QUIKSTEEL starts to setup, do not continue to make repairs, as it will not adhere properly.